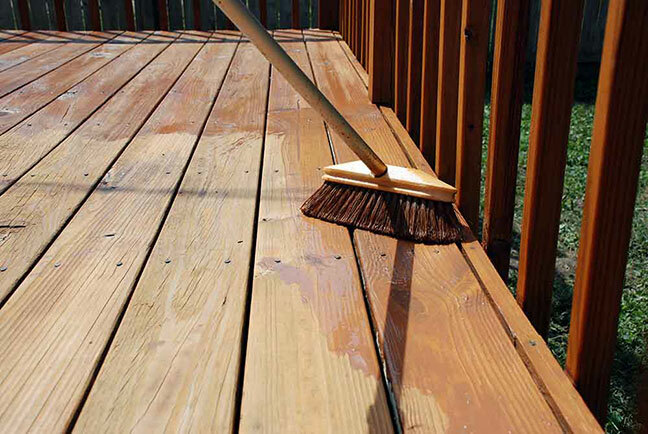 What are the best applicators to use for Deck Staining? Cons…it’s easy to get stain everywhere, likely in a lot of places you don’t want and it’s very difficult to control just how much stain you are applying. You’ll use quite a bit more stain than you planned on because the transfer efficiency is pretty poor (these sprayers atomize the stain so much that you may lose much of your product up in the air as mist, or over spray. Lastly, since nothing comes in to contact with the surface, to help push the stain in to the wood, you can end up with the stain laying on the surface of the boards, not being absorbed, and peeling. Cons…with the exception of the atomization issue, everything said regarding airless sprayers applies to pump-up garden type sprayers as well. Pros…good control, so you don’t have to deal with messy over spray, and the friction of the brush against the board really helps the stain to be absorbed deeply in to the wood. Cons…very slow to use, it’s going to add a great deal of time to your project. These types of brushes don’t hold a lot of stain so your brush stroke can apply more stain at the start of a brush stroke than it does at the end of the brush stroke, resulting in a blotchy or uneven application. Pros…Good control, and they do a good job of really working the stain in to the wood. Unlike the paint brush, they hold quite a bit more product resulting in a more even application. Cons…Though a bit faster than a paint brush, they are still slower than other means of application. Pros…a good, fast method of application combining nearly the speed of spraying with the control of brushing. These applicators offer good friction on the surface of the board, really working the stain in to the pores of the wood. Cons…due to their shape, they are really only good for use on the flat horizontal surfaces of the deck. Additionally, they can be torn up pretty easily when they come in contact with protruding screws and nails. Pros…push brushes offer all of the same advantages as a pad applicator with the advantages that they are more durable than a pad, and hold more stain than a pad, making the job go more quickly. Additionally, the bristles of a push brush are able to work down, between the boards, and coating both the sides and the tops of the boards in a single coat. A push broom applicator can even be used to stain difficult to treat lattice work. Cons…the only real con is that you can’t use a brush like this everywhere. Due to its shape, you still are better off staining spindles and rails with a good old fashioned block brush.